Aero India 2019 which was attended by British heavyweight industrial groups. Not all British companies have found it “entirely easy to operate in India” which is among the reasons for a still inconclusive Free Trade Agreement between the two countries, the UK government has admitted on 19 Mar 2019. A good number of UK-based heavyweight industrial groups, Rolls-Royce, Cobham and Gardner (see fiinews’ earlier reports) have been successful with ambitious future strategies in India, but Field has flagged some “high value” trade disputes British companies. Addressing questions from cross-party MPs on the influential parliamentary committee, he said “”It is fair to say not all British companies have found it entirely easy to operate in India. “There have been a number of high-value trade disputes that have required international arbitration. And, that has been a slight sense of a warning sign,” Press Trust of India (PTI) quoted Field as elaborating on the stumbling blocks to an UK-India FTA. Field, who is in charge of Asia in the UK’s Foreign and Commonwealth Office (FCO), said that difficulties remain despite the “positive step” of India’s 53-rank rise in the Ease of Doing Business rankings. 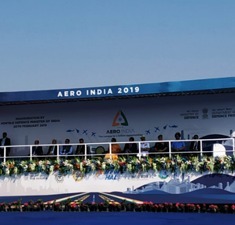 UK business leaders at the Aero India 2019, held in Bengaluru 20-24 Feb, had expressed strong desire to expand their businesses in India and had listed out potential collaborations in future strategic programmes in the defence sector right up to 2030s. “There is in no a de-prioritisation of the Indian issue, there are other FTAs which will probably be easier and smoother to manage, not least because they have reached the end of an EU FTA, or other countries like Australia and New Zealand, which are very much on the front foot to doing FTAs quickly,” Field pointed out. “I think there is a better news story than sometimes meets the eye. There is often a bit of a lag between the perception and reality of what is going on. But if it [visas] is being ranked overwhelmingly at No. 1 [as a trade hurdle] by our counterparts, then we do have to take it seriously,” PTI had Field as saying in London. Field was joined at the session on 19 Mar 2019 by Fergus Auld, Head of South Asia Department and India Coordinator at the FCO, who made a reference to the lengthy FTA negotiations between India and the European Union (EU) as a learning curve for future India-UK trade ties. He said: “With India, the Department of International Trade (DIT) is looking first at how to address other barriers to bilateral trade that would help build towards a future trade relationship rather than going straight for an FTA. “One experience that we have drawn is the lengthy negotiations between the EU and India on an FTA have not yet concluded,” PTI reported Auld as saying. The ‘Global Britain and India’ inquiry was launched by the FAC in July 2018 as part of a wider Global Britain series in the context of Brexit. It has been collating written and oral submissions from stakeholders on both sides to establish what more needs to be done to strengthen trade ties with India as the UK prepares to leave the EU, which will be compiled into a set of recommendations for the government later in 2019. Industry observers, closer to India-UK Defence sectors, feel both countries need urgent conclusion to trade concession-based FTA. This is because India needs as much foreign technologies as it can source on favourable terms given the incentive driven export potential from the country to the larger Asian markets.